Pentax today announced two new digital camera models in its Optio range. 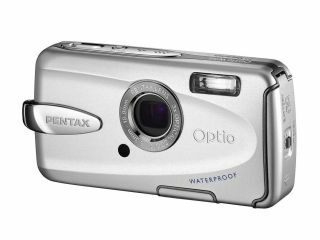 The Pentax Optio W30 is the latest model to be added to the company's W family of waterproof cameras. The Optio W30 is completely waterproof to three metres' depth for two hours, without the need of any extra waterproof casing. It is also dust and sandproof, so perfect for beach holidays this summer. It has a 7.1-megapixel CCD sensor, 3x optical zoom and a 2.5-inch LCD screen with adjustable brightness settings so that previews can be seen in all lighting conditions. The Optio W30 features face recognition technology and digital shake reduction, reducing camera shakes and blurry images. It shoots video at 30fps. Pentax also announced a new 10-megapixel compact digital camera today. The Pentax Optio A30 replaces the A20, and features face recognition and anti-shake technology that changes the light sensitivity settings in the camera according to brightness to reduce blurriness. It has a maximum ISO setting of 3200, which is ideal for low light conditions. The Optio A30 has 3x optical zoom, a 2.5-inch LCD screen, a 1/1.8-inch CCD,15 preset shooting modes and video recording at 30fps. The main addition to this model is its speed - it's ready to use in 1.8 seconds and has a quick 0.02-second shutter delay. The Optio W30 and the Optio A30 will both go on sale in March, for £190 and £200 respectively.